As a specialist in modern French literature of the twentieth century, professor-writer Laurence Campa has many works on the history of abstract literature, the relationship between literature and art, poetry and literature heritage, culture and history cross, culture memories ... Many of her published monographs deeply researched some of the most famous French literary writers of the twentieth century, such as Guillaume Apollinaire (1880-1918), Blaise Cendrars (1887-1961) ... Among her writings and researches there are remarkable works such as the collection of poems The Great war, Experience in combat and poetry (Classiques Garnier Publisher, 2010); Guillaume Apollinaire (Gallimard Publisher, 2013); The album Cendrars (Gallimard Publisher, the collection of "Bibliothèque de la Pleïade", 2013); and the Dove under the moonlight (Stock Publisher, 2017). Professor Laurence Campa has received numerous awards from prestigious literature organizations: The French Institute Award, the Award of supporting creative literary writings 2014 from Simone and Cino Del Duca Foundation, the Les Funds Treilles, Jean Schlumberger Prizes 2010 & 2011 and Point 2014 award for Guillaume Apollinaire, Gallimard, the "NRF biographies", 2013. 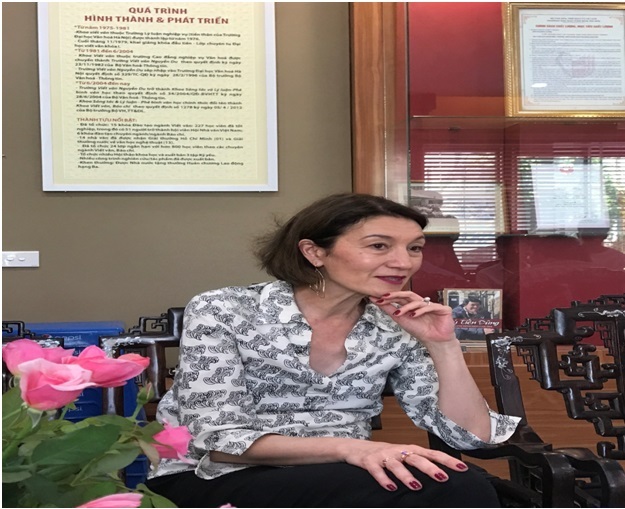 In the seminar at the Faculty of Writing and Journalism, Professor, writer Laurence presented some outstanding issues related to the field of study of the faculty - they were the experience in literary research and the skills of creating stories. Specifically, when studying the biography of one of the greatest authors of French literature in early twentieth-century, one of those considered the pioneers of the French surrealism - Guillaume Apollinaire, she devoted eight years of her life to collect, select, analyze the archives of this famous author. Fieldwork was used effectively by Professor Laurence Campa: she came to the cities where the poet had come to meet people who was acquainted with him, she put herself in the environment and world the poet used to live... The materials collected during these field trips were presented in a unique way and expressed her very ideas, the way to connect historical events was also very specific. Thus, the portrait of Guillaume Apollinaire in Professor Laurence Campa's work has both a historical dimension and the hallmark of the author - the researcher. Unbound from a more or less restricted literary genre that depends on the real historical figures and events, professor-writer Laurence Campa has tried in a more liberal, imaginative and emotional literature. The dove under the moonlight novel published by Stock Publisher in 2017, as writer Laurence Campa comments "containing pure fiction". Through the fate of the protagonist, the humanistic message that writer wants to send to literature lovers is: man can overcome every difficulty of life only with the power of the will and mind. The guy character in the novel represents a "loss generation". He lives in a world with losses of childhood, love and friendship when his friends, companions in arm fell during the First World War (1914-1918) ... These challenges of life do not make the character fall, but rather give him a strong will, the maturity of the personality and mind. The story of the main character's fate in the Laurence Campa's novel The dove under the moonlight reminds of the old fisherman Santiago in the great book The Old Man and the Sea published in 1952 by American writer Ernest Hemingway, the beautiful portraits of the powerful will, mind that cannot be forced to yield by the harsh trials of the sea, the nature and the life. The humanity and the spirit of education are probably the target of genuine writers. In addition to the two main contents of sharing the literary research and writing, the relationship between the researchers and the writers, there was an academic interaction between the professor, the writer Campa and lecturers, students of the Faculty of Writing and Journalism. In response to the questions and exchanges of lecturers of the Faculty, Professor - writer Laurence Campa agreed that: reading deeply the biography of an author is the unique way to understand the author's spiritual portrait and literary writers should dare to experiment with new writing techniques, dare to "challenge themselves" and dare to face up to the challenges created by these new writing techniques because every new technique cannot be sure of effectiveness as the author desired. She also elaborately and more deeply presented the steps to be taken to achieve the highest efficiency in literary research. The Seminar takes place over a limited period of time, but the academic sharing, the interaction between the speaker and the audience not only brought useful knowledge of the art of writing in literature and journalism, research methods, some literary theoretical issues such as the link between research and writing, history and literature for lecturers and students of faculty, and to inspire attendees, but also created a bridge connecting the first step between a long history training institution on writing and journalism of Hanoi University of Culture with foreign researchers and writers.